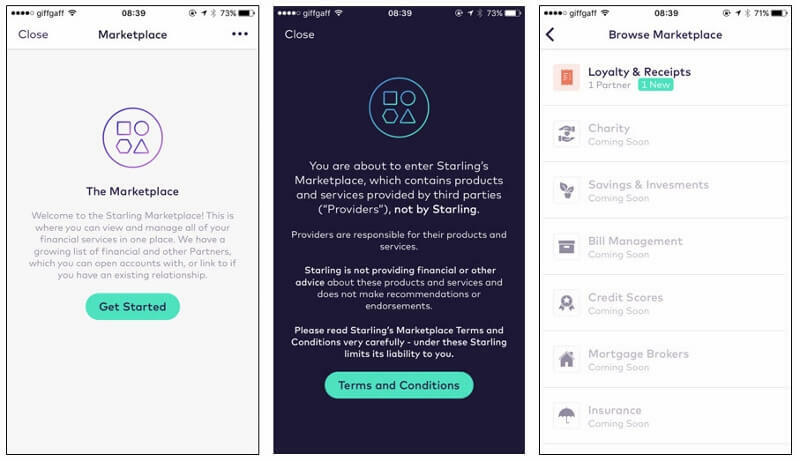 Latest Starling news (December 2017): Starling receives regulatory approval to become a marketplace banking app. Starling’s current account offers a host of features aimed at challenging traditional and old-fashioned current accounts from incumbents. Starling offers fully digital onboarding via ID scanning. The app lets you view and manage your financial status in real time, with push notifications deployed for each transaction, and a home screen feed called the Starling Pulse with all account activity displayed. Starling offers live chat functionality within the app as well as the ability to message or call an advisor for help and support. Qualifying customers receive an overdraft facility, and handily can control the overdraft amount and other settings from within the app. Like Monzo, Starling is going after the ‘one-stop-shop’ position in your mobile banking life. By eventually offering a financial ‘marketplace’, where additional products from other FinTech startups can live, thanks to an API, they aim to become a hub where users connect all their financial information in one place. ‘There’s an ecosystem out there of innovative and creative FinTech organisations. We are going to be the centre of that ecosystem, linking customers to the right products from the right partners,’ said Boden. Aggregation like this will not only (ideally) offer customers a holistic view of their financial health, it gives the hubs in question a chance to cross-sell new products in a smarter way than ever before- using broad data about the customer’s behaviour and spending/savings/browsing habits. For Starling, the partnerships with TransferWise and Moneybox are sure to be the first of many, with mortgages, loans and other financial products likely to be promoted in the app. We have outlined the challenger bank’s main updates and developments over the past year in a handy timeline below. In 2016 Starling secured $70m in investment and also received its banking license from the Financial Conduct Authority. Despite this strong position the bank did not rush into releasing a current account straight away. The bank used the investment to develop the app and the current account and waited until March 2017 to launch its first product. Starling was the first challenger to join the Faster Payments Service in January, despite not yet being available to the public. The scheme allows customers to see where their money is going in real-time, 24 hours a day, and was soon adopted by other challenger banks. Starling finally launched its beta mobile app to people on the waiting list in March 2016. The app enabled customers to sign up for a current account using a fully digital onboarding process via ID scanning. Setting up an account through the app involves photographing your passport or driving licence to confirm your identity. After applying for a current account, customers are sent a MasterCard debit card and can use the app to service their account. March also saw Starling partner with TransferWise. This partnership means that customers are able to transfer funds cheaply to foreign bank accounts in 35 currencies, using an API from TransferWise. This deal promises FX transfers to third party bank accounts at Reuter’s benchmark exchange rates, for an unspecified ‘small upfront fee’. The partnership with TransferWise (who also supports N26 in Germany) is sure to be the first of many, with mortgages, loans and other financial products likely to be promoted in the app’s ‘marketplace’. April saw Starling Bank announce its second third party partnership, this time with Moneybox, allowing customers to link their account to the Moneybox mobile app. It is the first UK challenger to do so. Moneybox has also made several recent updates to its app to include: Pay day boost- allowing users to set up lump sum deposits on their payday. Forecasting- this feature projects the value of investments if users deposit extra funds into their account. Super round ups- change is rounded up to the nearest pound from each card transaction is then doubled and invested. Starling’s partnership with two other FinTech firms within two months of launching its beta app is indicative of its focus on becoming a one-stop-shop aggregator platform with a wide range of services available. The Starling app became available to download from the app store in May, and it announced the launch of a new service that will grant other leaders and FinTech companies’ access to Britain’s payment systems through its API-driven technology. Starling Payment Services will enable new market entrants to offer their customers real-time digital payments without having to rely on the established high-street lenders, ensuring payments are open and connected, and removing a real barrier to entry for budding payments providers. The service will offer sponsorship access to the UK’s major payment schemes, allowing other banks, payment service providers, and FinTechs to use real-time payments. Access to Faster Payments is included in the offering, which Starling says it aims to offer using its API-driven, real-time technology. 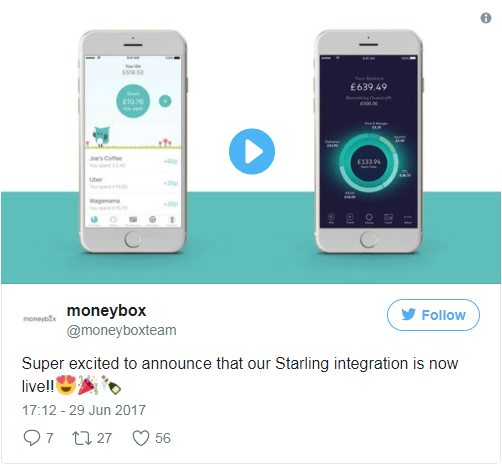 Following the announcement of the partnership in April, Moneybox integrated Starling into its app in June. Moneybox customers were now able to connect their Starling accounts and use it for real time round-ups. Starling announced in July that it was allowing customers to add their card to the Apple wallet within the Starling Bank app. July saw Starling roll out its referral marketing scheme ‘Starling Pass.’ Users were given codes which can be found under the ‘Invite to Starling’ tab that could then be sent to friends and family. The code allows customers to skip the queue and gives them instant access to a Starling account. This system is similar to Monzo’s highly successful ‘Golden Ticket’ referral marketing scheme and Starling will no doubt be attempting to emulate the rival digital bank’s word-of-mouth successes. 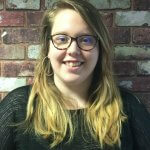 In July, Starling launched its online ‘Starling Community’. From this online platform, users are able to join the bank, follow its progress, share feedback, ideas and suggestions. Customer support is essential for any challenger bank to succeed and by involving users in an active way in the development of the bank, Starling can hope to foster brand loyalty and enthusiasm. During the early stages of a banks development, when there are bound to be teething problems, this loyalty and investment in the bank’s potential is extremely important in building a solid customer base. The Monzo Community has been extremely successful with users actively discussing potential new developments and features and engaging with Monzo’s staff. Challengers are largely positioning themselves as customer-focused banks and so developing these online communities is essential for their success. July saw Starling partner with Tail, a London-based offers app. Tail was built on Starling and Monzo’s APIs and recommends food and drink offers in users’ local areas. In order to redeem offers, all customers need to do is use their Starling or Monzo cards in a participating retailer. The user then builds up cashback that is paid to customers on a weekly basis. September saw the launch of Starling’s long-awaited Starling Marketplace, an innovation that has the potential to set the challenger bank apart from its rivals. While still in its early stages, Starling Marketplace will allow customers to view a list of third parties that will be accessible and serviceable from within the app using APIs. The first third party to be integrated into Starling Marketplace is Flux. Flux is a receipt management startup, set up by former Revolut employees and originally launched with Monzo in a limited pilot. Flux allows customers to access much more detailed information about transactions carried out at retailers who partner with Flux, offering customers digital receipts, loyalty programmes and rewards. While Flux has only partnered with London-based eateries Eat and Bel-Air so far, we can expect this list to grow following its partnership with Starling. After Starling’s late start, the launch of Starling Marketplace has finally provided observers with a view as to what the digital bank can offer that its rivals cannot. The Starling Marketplace is an innovation that Monzo and Revolut are sure to want to mirror in their own apps. However, with Monzo only now rolling out a limited version of its current account, it appears that it is now in the position of playing catch-up. While Starling may be making waves in terms of innovation, it still has a way to go if it wants to match Monzo’s cult-like following of dedicated users and so it will be interesting to see how effectively the Marketplace is integrated and who it partners with over the coming months. In October Starling announced that it is moving into business banking, with the launch of its new business accounts for small traders and SMEs. Following in the footsteps of digital-only SME banking service, Tide, Starling is the latest challenger to move into the SME space. The bank states the new account can be opened within five minutes. In addition, Starling’s newly launched API marketplace means that it will be able to provide access to a wide range of additional third party, business centric services from within its app. The challenger bank’s only currently integrated partner is digital receipt start-up Flux which aims to get rid of paper receipts by capturing a digital version of the receipt on the user’s device. Starling has promised its users that they will soon have access to invoicing and accounting services via the marketplace in addition to its native features, such as categorised transactions and international payments. Starling has also launched a business banking specific forum on its website where users are able to contribute to its development. The topics allow users to suggest features and have wider discussions about digital business banking; allowing Starling to develop the app in a way that meets its users’ needs while engaging with the customer base. Customers who are interested in Starling’s business account need to sign up to a waiting list on its website to join a closed pilot later this year. With similar services being launched by Starling’s rival challengers, Revolut and TransferWise, it will need to ensure that its business services are effective and that it partners with the right companies to ensure its marketplace is a useful tool for small businesses and sole traders. 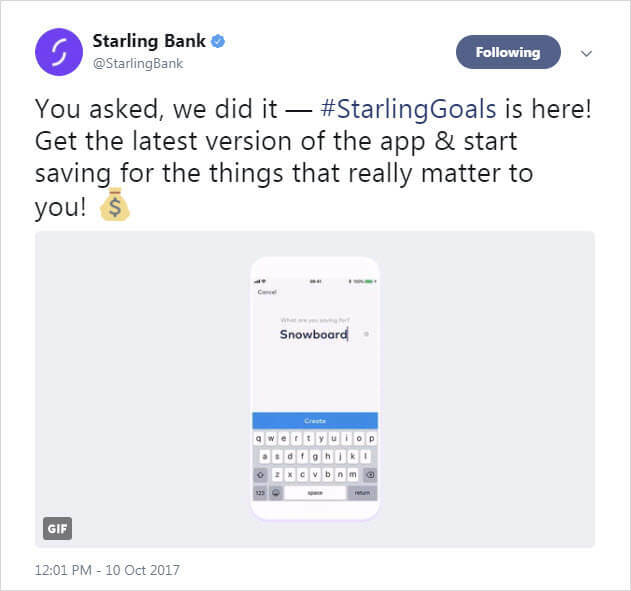 When Starling asked its customers what feature they were most looking forward to seeing in the banking app, Savings Goals were at the top of the list. On 10 October, Starling Goals were introduced in the updated version of its app. Users can now create a goal, add a picture and set targets. Starling has become the first UK bank to connect with FitBit Pay. The fitness band provider recently launched its response to Apple Pay. FitBit Pay is available in the provider’s new wearable device, a smartwatch called Ionic. Rolled out a month after the Ionic went on sale, the payment technology will enable Starling customers to link their accounts to the smartwatch and make payments at any contactless payment terminal. December saw Starling reach an important milestone in its mission to become the first, and best, marketplace digital bank. Starling officially received regulatory approval from the Prudential Regulatory Authority and the Financial Conduct Authority to offer a full range of banking products through its marketplace. There has been a steady stream of partnerships announced over the past few months, with more expected in the new year. The latest start-up to partner with Starling is invoice and expense platform Albert, an invoice productivity app that allows freelancers to easily manage their finances. Users will be able to access Albert through the Starling marketplace once Starling’s business accounts launch in early 2018. With business accounts, regulatory approval for its marketplace and an increasing number of partnerships, Starling’s development pace seems to be outstripping rivals Monzo and Revolut. Once PSD2 comes into action in January however, we can expect to see a wide range of open banking functionalities, partnerships and innovations across the board. Starling has announced that they will be making SEPA payments available later in 2017, so providers will also be able to offer Euro payments. After Revolut recently introduced Euro current accounts, a clear benefit to challenger banks is their cross-border capabilities; this new feature will help expand Starling’s offerings and is a step towards it moving into the European market. Starling is taking the step of introducing virtual cards, meaning customers will no longer have to wait for a physical card in order to start making purchases. The app will also soon support digital wallets, meaning users will be able to use their Starling accounts from their phones, making purchases quickly and simply through the likes of Touch ID. Starling has promised a host of new features and updates over the next few months to keep pace with the last few months of development. The digital bank is planning on evolving their Starling Pulse feature to allow users a better view of their spending over time. The bank is also planning on introducing more security features which will offer greater control to the users. One of these features will be adding the ability to lock and unlock card transactions for different transaction types. For example, if you misplace your card you will be able to lock it for contactless and online transactions while keeping it active in the digital wallet. Users will also be able to lock their card by country when they are travelling, ensuring that they have total control over their finances. Two developments that the bank has shown interest in developing are joint accounts and accounts for under-18s. These are two areas with great potential for the challenger bank. A Starling ‘connected account’ would let customers link their separate accounts with partners, friends and flatmates in order to help manage joint finances. This would provide a huge benefit to users who want the ability to manage finances together but don’t necessarily want to commit to a traditional joint current account. Starling has also expressed an interest in providing accounts for under-18s which would let young people manage their finances and access the same budgeting tools found in the full account, while allowing parents control over their child’s finances. Providing accounts to under-18s is a no-brainer for digital banks as young people are generally more inclined to embrace new digital developments. The budgeting and money management tools are also extremely useful for young people learning about their finances for the first time. Starling plans to ensure that the under-18s account does not expire when the user turns 18, instead it will transition into a full current account, retaining historic transaction data and insights. This will harness brand loyalty from a young age and will potentially help the bank’s longevity. While these updates are potentially very promising, the bank has not committed to these features yet and is only just looking into them. It is very possible that Starling’s rivals, such as Revolut or Monzo, could release similar features before Starling. The Starling Marketplace officially launched in September and is probably one of the most significant and innovative developments that we’re can expect to see evolve over the coming months. This is an important move towards building an effective aggregator platform that will allow users to manage all of their finances and accounts from within one app. The bank has promised a range of new partnerships over the next few months with products that will help with lifestyle, travel and fitness as well as finances. This is an important move for the digital bank, and if executed successfully, it could be the factor that sets the challenger apart from its rivals. After only launching its app to the general public in May 2017, Starling has had a very busy few months. The challenger took the risky decision to not become available to customers until they were able to provide them with a full current account. Since March 2017, Starling has introduced a host of new features; however the app is still fairly basic in comparison to some of its competitors and although the bank has not released the number of active users it has, it is presumably well below that of Revolut and Monzo. With new functionalities, such as Apple Pay and partnerships with financial providers such as Moneybox, being added at a rapid pace, Starling has the potential to outstrip Monzo and Revolut in terms of capability. However, Starling’s ability to transfer these updates and functionalities into an active and enthusiastic user base remains to be seen. The next few months look extremely busy for the challenger bank, and while it has had a late start, if the bank manages to integrate the features it has promised and develop more partnerships, it could become one of the most comprehensive and innovative challenger banks on the market.